2017 has been a challenging but very rewarding year and I would like to end it, by thanking very much all the participants in both “Beyond the Noise” and “Hush City” projects, as well as those who dedicated their time to share with me stories and secrets about their favorite quiet (and less quiet) spots in Berlin and beyond. I would like also to thank very much the journalists, who, intrigued by the topic of noise pollution and quietness in cities, got in touch with me and published wonderful articles and posts about how these issues have been treated in the framework of both “Beyond the Noise” and “Hush City” projects. If you missed some of these articles, you can find a recap here. The role played by journalists is fundamental in disseminating the research works done by the scientists and in helping them to reach out the public; however, it is important to monitor these publications to avoid mistakes and/or misunderstandings, which can happen, when English is used as a lingua franca, leading to unexpected events. As it is the case happened to me few months ago. On August 5 2017, while I was in Italy to visit my family, an article about my research projects on urban quietness and the Hush City app was published in the magazine Berliner Abendbladtt and distributed in the letterboxes of the Berliners across the city. A very good promotion for the projects and the app I was totally unaware of! I assume, indeed, that the journalists read about the projects in the media coverage (e.g. Berliner Zeitung, Berliner Kourier et al.) and then decided to cover the issue on their magazine, without getting in touch with me. The day after, on August 6 2017, I got an email from Mr. Gerhard Hochhuth, who drew my attention on this article, complaining about the content reported in it and asking for clarification. 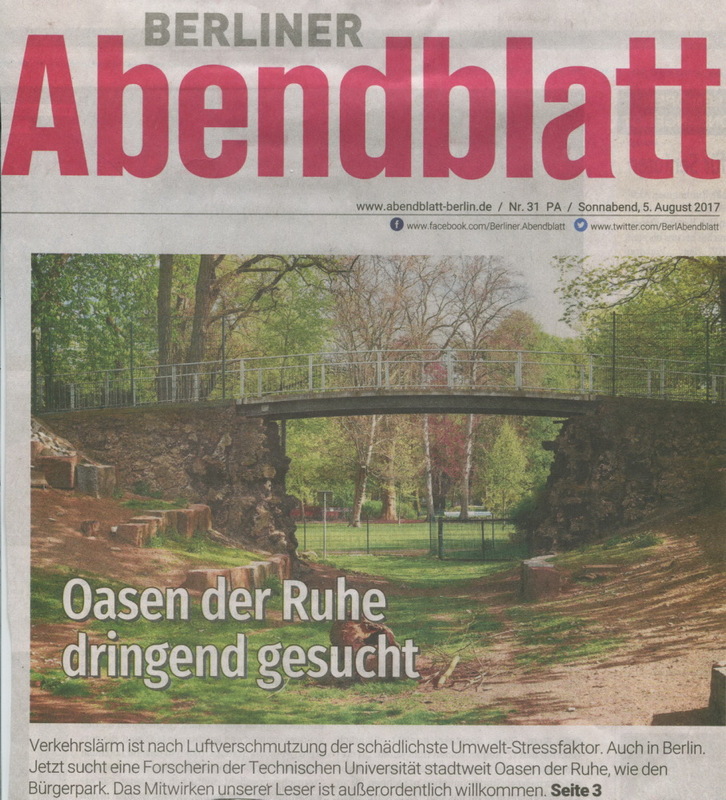 The journalists, indeed, to introduce the topic of my research on urban quietness, used the case of Bürgerpark Pankow in Berlin as an example of a quiet oasis in Berlin, whereas, in the reality, this park is one of the noisiest spot in Berlin, due to noise pollution from aircrafts to and from Tegel airport! Furthermore, the article was accompanied with a beautiful picture of the park, which contributed to convey the idea and feeling of peacefulness and quietness, as you can see below. If interested, you can read the digital version of the article in German here. Cover of the magazine Berliner Abendblatt, reporting the overview of the article published at p. 3 (image courtesy of Mr. Gerhard Hochhuth). I cannot forget the mix of emotions I felt while reading the email received from Mr. Gerhard Hochhuth: sadness and anger, for the misunderstanding and the erroneous information reported in the magazine, and, on the other hand, gratitude and joy, for being informed and contacted by Mr. Gerhard Hochhuth. My reaction was immediate: I replied to the email, clarifying my point and asking for a meeting in the Bürgerpark Pankow area to have a (sound)walk around. Mr. Gerhard Hochhuth gently agreed and, on September 26 2017, I left Kreuzberg for Pankow, where I met Mr. Gerhard Hochhuth, who generously brought me around Bürgerpark Pankow, telling me the past and present story of this gorgeous park. If curious, read the history of the park and current projects here and here (links courtesy of Mr. Gerhard Hochhuth). In the meanwhile we were (sound)walking around this beautiful park, every 2/3 minutes, an aircraft was crossing the sky just upon our heads. The noise was so loud that we had to stop talking and wait for the aircraft passed by, before continuing our conversation. What a perfect oasis of quietness! I really could not understand why and how the journalists referred to it as the ideal heaven of quietness in Berlin. Really. In-between one aircraft and the other, we spent one hour (sound)walking around the area, which is indeed extremely beautiful as well as alarmingly noisy. Community groups in the neighborhood are also pretty much active in their fight against Tegel airport, due to the high levels of noise pollution which not only disturbs their quality of life, but it constitutes an health hazard for all the residents. Click here to read the harmful effects of noise on human health. 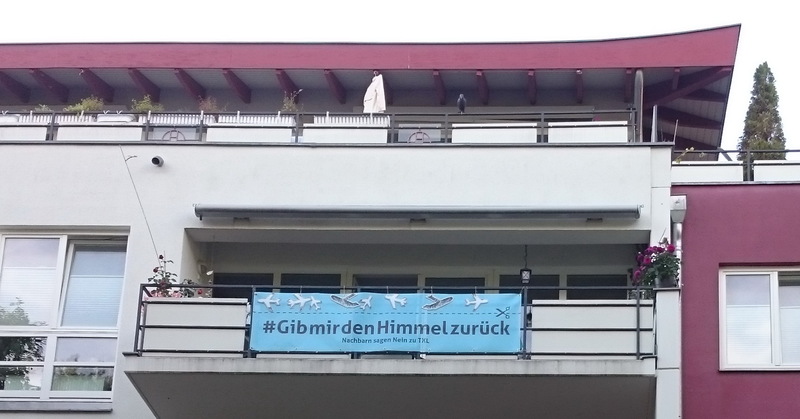 Picture of a board hung up to the balcony of the buildings surrounding the Bürgerpark Pankow, reporting the motto “Give me the quiet back” (the translation from German is mine; image courtesy of Mr. Gerhard Hochhuth). Luckily, a bad beginning does not keep you from a good ending. In my case, a misunderstanding led me to meet a very generous and interesting person, Mr. Gerhard Hochhuth, who so kindly shared with me his everyday life experience and knowledge of the area and informed me about a detrimental issue of noise pollution in an area of Berlin which I had not yet visited. It was such a very rewarding moment that I wanted to share it with you all in my last post of 2017. And, now, to conclude, along with my wishes for a peaceful and quiet 2018, I wish you all to not forget to “climb out of our bubbles, emerge from behind our screens, walls, loudspeakers and headphones and open ears directly to the environment” (Westerkamp, 1974). Let’s keep on fighting for a high quality of our city soundscapes. On October 14, the Reuterkiez Stadtteil-Tagung took place and we had a wonderful day of exchanging and debating about the neighborhood. It was also a great opportunity to meet new people and imagine together a quieter future! Thank you so much to the Stadtteilbüro Reuterkiez for having made this event possible and so special, and, of course, thank you to all those who participated with their energy, passion and dedication. On that day, I had the privilege to set up a corner dedicated to “Beyond the Noise: Open Source Soundscapes” project, thanks to Rabea and Dominik from the Stadtteilbüro Reuterkiez who encouraged me to do it. 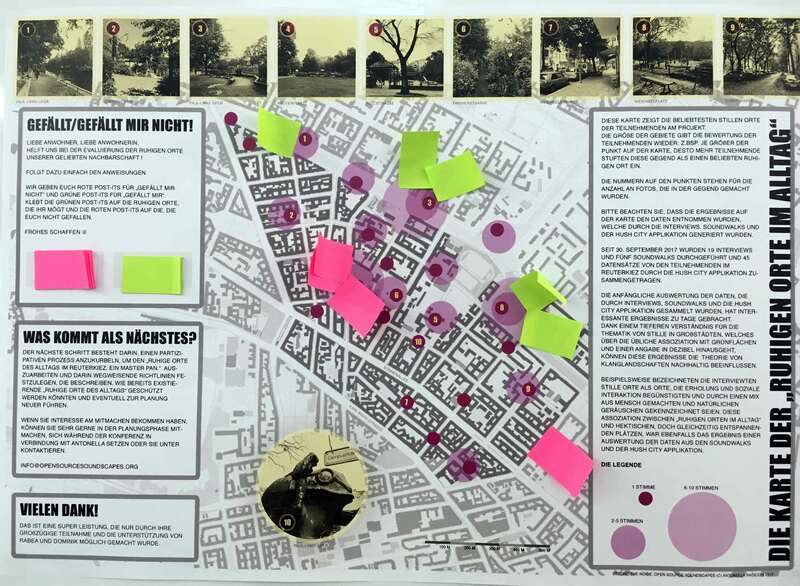 By means of visual tools, I described the project’s rationale, its goals and methods and I presented the project’s first results through a colourful and interactive map: the Reuterkiez “Everyday Quiet Areas Map”. This maps shows the favorite “everyday quiet areas” identified by the participants in the project. The size of areas relates to the rating given by the participants: e.g. the bigger is the dot, the bigger is the number of participants who indicated that area as their favourite quiet area. The numbers displayed on the dots refer to the pictures of the areas framing the top of the map. The results displayed on this map come from the overall data collection, which took place between May and September 2017 in the Reuterkiez in Berlin, by means of interviews, soundwalks, and by using the Hush City app. As of September, 30 2017: 19 interviews were made, 5 soundwalks were performed, 45 datasets were collected by participants in the Reuterkiez, by using the Hush City app. The initial evaluation of data collected through interviews, soundwalks, and the Hush City app, has yielded interesting results. Data evaluation led to a more complex understanding of the notion of quietness in cities, beyond the common definition based on sound levels. For example, in the interviews, people have referred to quiet areas as places, which favor relaxation and social interaction, and are characterized by a mix of natural and human sounds. This association between “everyday quiet areas”, expected on the local scale, and lively, yet relaxing places, resulted also from a cross evaluation of data collected through the soundwalks and the Hush City app. You can read a bit more about the project, its first results and future challenges here. During the day, people were invited to evaluate the “everyday quiet areas” identified by the participants in the project, by playing a simple interactive game: the LIKE OR UNLIKE IT! game. A number of red post-its for UNLIKE and green post-its for LIKE were provided and people were invited to place green post-its on the quiet areas they liked, and the red post-its on those quiet areas they did not like. The results can be seen hereafter! These initial results can be said to be advancing soundscape theory and they can be applied in city planning. Keep on following us if you are interested in learning more about the integrated planning process we aim to achieve. The next step indeed consists of establishing a participatory process to draft the “Reuterkiez Everyday Quiet Area Master Plan” and to define planning guidelines on how to preserve and improve the existing “everyday quiet areas” and, eventually, planning new ones. If you would like to join us and participate in the planning phase, please get in touch by dropping a message at antonella.radicchi@tu-berlin.de. Let’s meet at the Stadtteil-Tagung for a sneak peek of the project’s results! 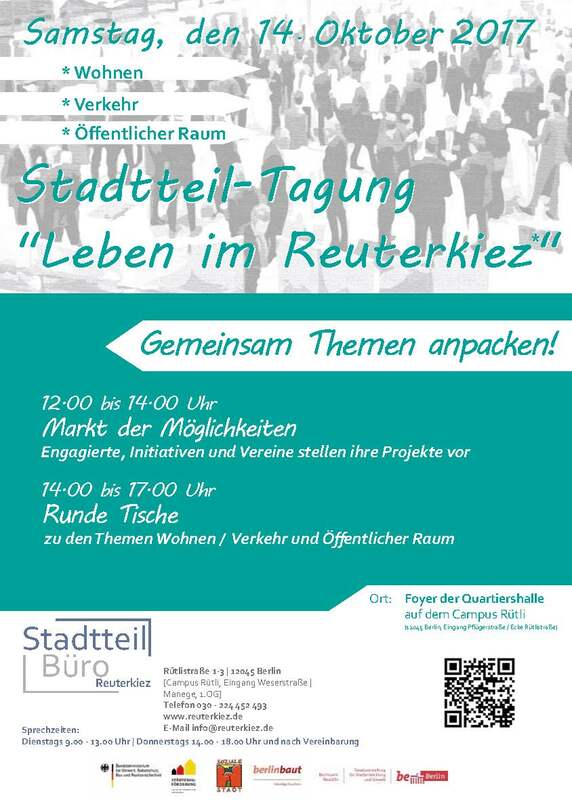 The Stadtteil-Tagung organized by Stadtteilbüro Reuterkiez is approaching: so, let’s meet next Saturday for an afternoon of debate on issues affecting the neighborhood, such as housing, mobility and public spaces! It’ll be also an opportunity to know each other a bit further. I will also be in and I will take the opportunity to share with you the “Beyond the Noise: Open Source Soundscapes” project’s results, collect feedback on them and launch the next step of the project. And, don’t forget to join us for the LIKE OR UNLIKE IT! Game.There will also be a map displaying the favorite quiet areas identified by the participants in the project and you will be asked to evaluate them, by placing LIKEs/UNLIKEs on them. In the past weeks, I have been experimenting with newsletters to keep updated the participants in the project and I thought to post them on the blog, making them available to the public. You know, just in case my followers were wondering how things are going on with the project! So, here it is the first newsletter. Happy reading! This note is firstly to thank you all very much for participating in the “Beyond the Noise” project, to update you on what we have done so far and anticipate the next steps. Time flew away since we kicked off this participatory project to study how to identify, evaluate and protect quietness in the Reuterkiez! Summer is over and it is also (almost) completed the first phase of the project, in which both empirical data and your feedback about noise pollution and quietness in the kiez have been collected, by means of interviews, group soundwalks and the use of the Hush City app. 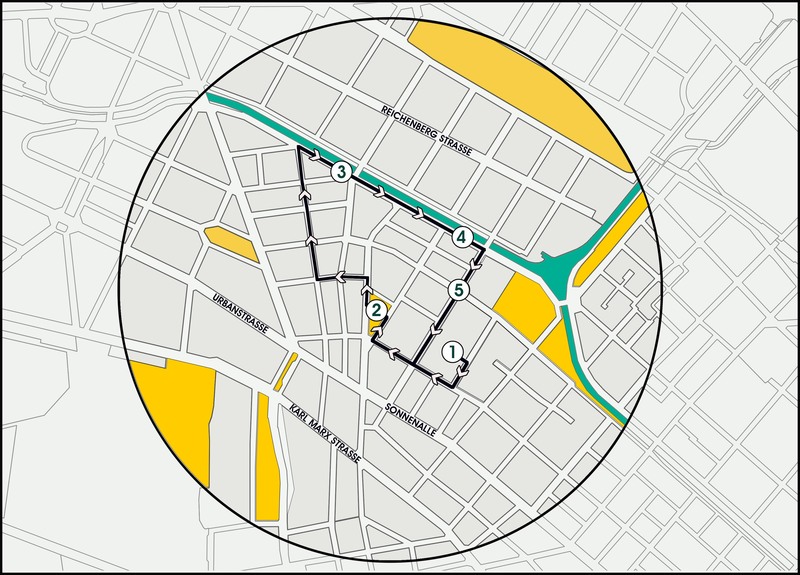 It has been a great and rewarding experience: we had 15 interviews (some are still in progress), we went out for 5 soundwalks, and 85 datasets were collected by using the Hush City app. Such a great job, which, of course, was made possible only by your generous participation and the important support by Rabea and Dominik. 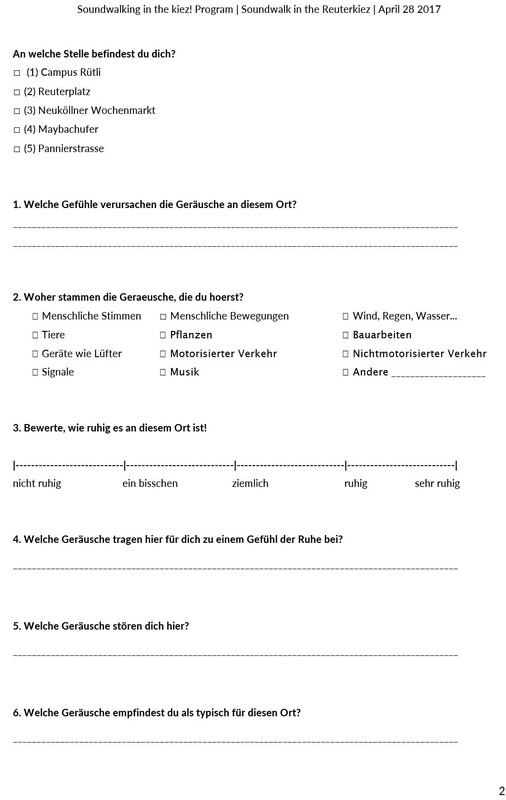 I’m currently analyzing data collected, with the aim of reporting the results and discussing them with you in the framework of the Stadtteilkonferenz on October 14 2017. I look forward to it! In the meanwhile, if you don’t mind, I will send you, here and then, some sneak peaks of the results to keep you updated with the progress. However, if you are not interested in getting the updates, please reply to this email and write “No, thanks”. Your address will be immediately deleted by the mailing list. On the other hand, if you like the idea, please don’t hesitate to circulate these emails around! Thank you very much and ‘till soon! I’m pleased to share “A Pocket Guide to Soundwalking”, my essay on soundwalking envisioned especially for the newcomers to this method, such as architects, city planners and policy makers, yet also for everyone interested in learning how it is a soundwalk, its main purposes and how it can be designed and performed. Please, find here my essay and here the book. Looking forward to getting your feedback on it! On April 28, we celebrated the International Noise Awareness Day 2017, by means of a group soundwalk in the Reuterkiez in Berlin. The International Noise Awareness Day (INAD) was founded by the Center for Hearing and Communication in 1996 to encourage people to do something about bothersome noise in the places where they work, live, and play. Since then, INAD has been celebrated every year on a Wednesday in April by individual member societies associated with the European Acoustics Association (EAA) in countries such as: Germany, Spain, Italy, Austria, Greece, Portugal, and Switzerland. Usually, series of events have been organized to address the society, especially young people who are among the most sensitive parts of our society. This soundwalk in the Reuterkiez was organized by me and Michael Jäcker-Cüppers from the German Acoustical Society (DEGA), in collaboration with Rabea and Dominik from the Stadtteilbüro Reuterkiez, Prof. Juliana Kohl and the students from the Rütlischule and it was supervised by Prof. Schulte-Fortkamp (TU Berlin) as a National Representative for INAD17. This soundwalk was also part of the “Soundwalking in the kiez! 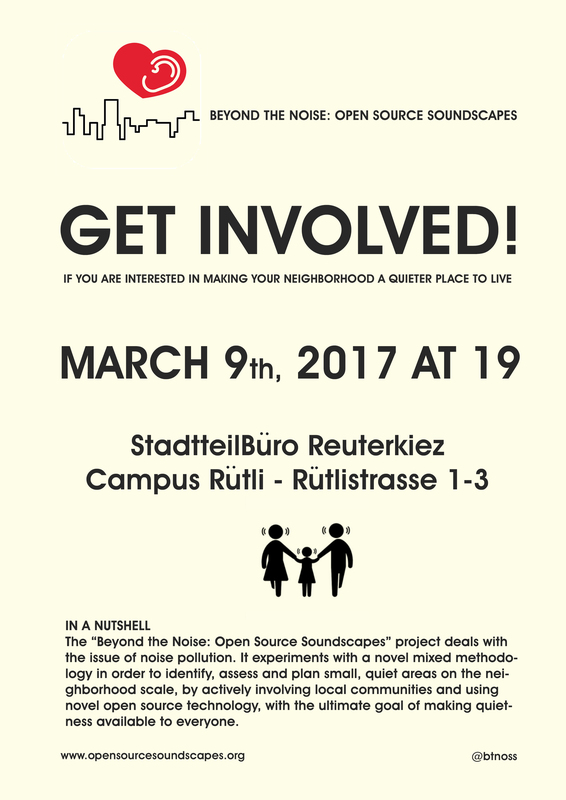 ” Program, which has been envisioned and organized by Stadtteilbüro Reuterkiez and me in the frame of the “Beyond the Noise: Open Source Soundscapes” project I have been conducting in the neighborhood, in order to promote and diffuse the soundscape culture in the Reuterkiez. 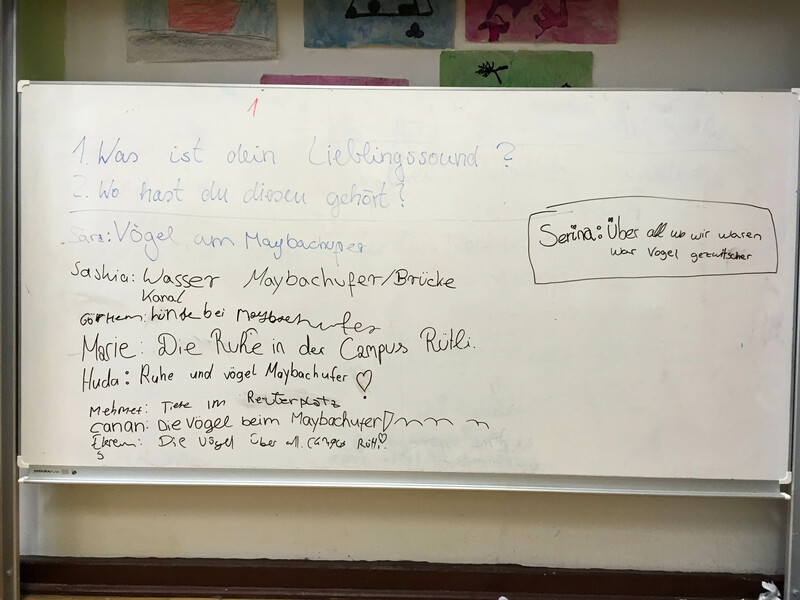 In detail, this year the soundwalk’s goal was to focus on the importance of identifying and protecting “everyday quiet areas” by involving young students from the Rütlischule in this process. You may now wonder what is a soundwalk! In the words of Hildegard Westerkamp – the German-Canadian composer and musician who, since the Sixties, has contributed to the definition and spread of soundwalking – a soundwalk is “any excursion whose main purpose is listening to the environment”. Since the early examples of soundwalks, practitioners have experimented with a huge variety of methods within the arts and humanities, social sciences, ecology studies and engineering; accordingly a search for the most appropriate method could represent a challenge, especially for newcomers. Thus, in my essay “A Pocket Guide to Soundwalking”, I provided a theoretical framework where methods are differentiated and explained according to the purposes to be fulfilled: civic and political, educational and research. 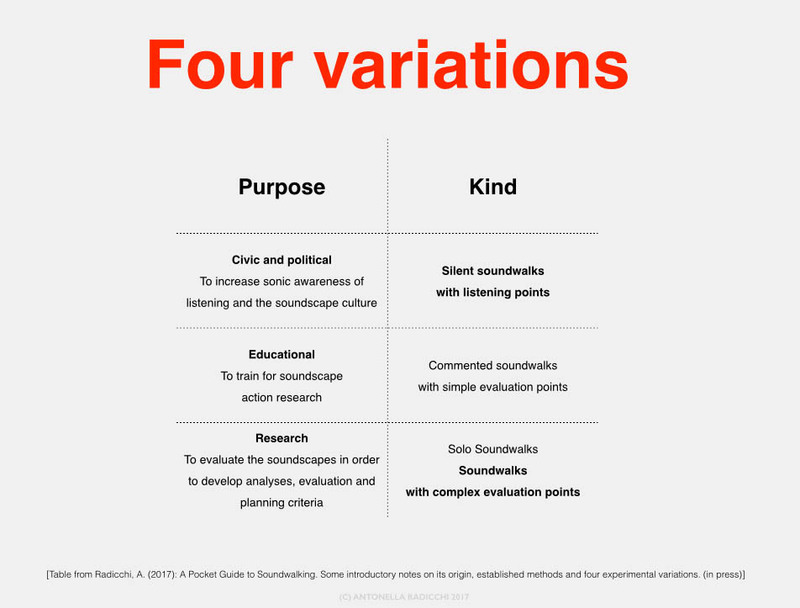 In the case of the INAD17, I designed the soundwalk applying the method “soundwalk with complex evaluation points” with research purposes (see Fig. 2), defining a route with several evaluation points along the way for the collection of qualitative and quantitative data (see Fig.3). Then we prepared a questionnaire to hand out to the participants, with questions drawn mainly to evaluate quietness and understand which sounds positively and negatively impact on it. Questions to investigate the impact of the soundscape on feelings and sense of place were also included (see Fig. 4). On April 28 2017, the activity took place from 1pm to 4pm. Michael gave a short introduction to the students in class, then we went out for the soundwalk with the group composed of nine thirteen years old students, their teachers Julian and Felix and Dominik form the Stadtteilbüro Reuterkiez. I guided the soundwalk and we walked in a line at a slow pace, stick to the predefined route, in silence. We stopped at each evaluation point, where we focused on listening for one minute, in silence, and then we collected mixed data – students by replying to the questionnaires and Michael and me by making noise measurements and field recordings respectively. This procedure was repeated at each evaluation point. For noise measurements we used a SAUTER SU 130 sound level meter and for field recording my ZOOM H4n. At the end of the soundwalk, we went back to class where a group discussion took place. Students were invited to give feedback on their favorite sounds and the place where they heard them (see Fig. 6). Fig. 6. Picture of the dashboard reporting the students’ feedback on their favorite sounds and the place where they heard them (CC) Antonella Radicchi 2017. From an initial evaluation of the data collected by means of questionnaires and noise measurements, we got interesting results. 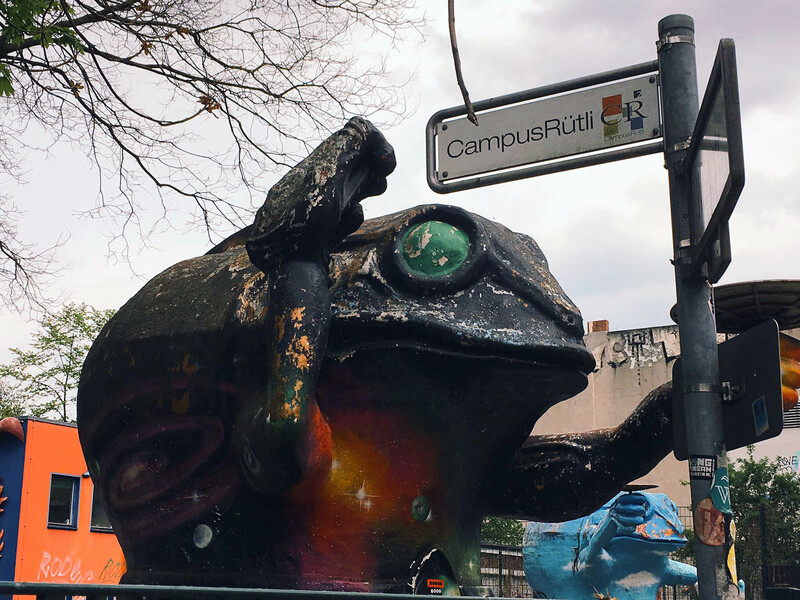 While at Campus Rütli sound pressure levels were lower than those measured at Reuterplatz (Leq 56,4 dB(A) versus Leq 59,8 dB(A)), most students perceived the soundscape at Campus Rütli rather less quiet than the soundscape at Reuterplatz. Sound pressure levels measured along the canal at Maybachufer were about Leq 58,6 dB(A), however students perceived the soundscape in different ways: some of them rated it as „slightly quiet“, others rated it as „quiet“ and „very quiet“. On the other hand, everyone agreed that soundscape at Pannierstrasse was „not quiet“, in accordance with the sound pressure level measurements (Leq 70 dB(A)). With regard to the relation between quietness and feelings, students associated „quiet“ and „very quiet“ places with positive feelings, such as calm, relax, pleasantness. Among the sounds, which were indicated to have a positive impact on quietness, birds chirping was the most rated even in noisy spots such as Pannierstrasse; natural sounds coming from water, wind and trees also resulted in having a positive impact on quietness in the Reuterkiez. The sound, which mostly disturbed the sense of quietness, was associated with cars and traffic lining also rather quiet places such as Reuterplatz and the canal. A more detailed discussion of data collected is under development and it will be published in the next months. So, keep on following this blog, if you are curious to learn more about it :). 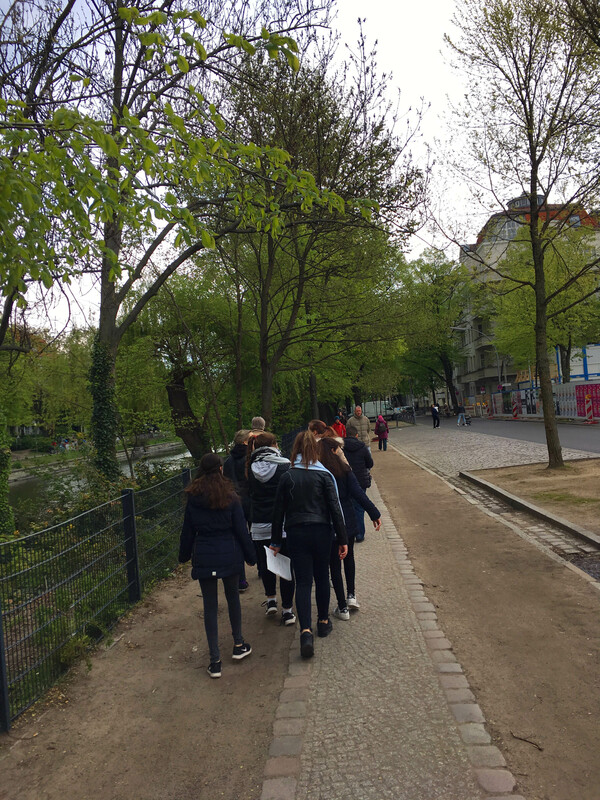 To conclude, soundwalking in the Reuterkiez with the students from the Rütlischule was a very rewarding experience and it confirmed the power of soundwalking as a tool for understanding and evaluating the sonic quality of our cities. We therefore recommend the integration of this kind of experience-based and participatory method in soundscapes evaluation and planning processes at the municipality level. And we look forward to the next soundwalk in the Reuterkiez! Hush City: the app to map and find quietness in cities! With this free app, you are an active part of a citizen science research project to map and evaluate quietness in cities. Our cities are becoming noisier by the hour. Only in Europe, over 125 million people are affected by noise pollution from traffic every year, and apparently, quietness is becoming a luxury available only to a few of us. By using this mobile app, you will contribute to making quietness available to all those appreciate it. Join the community. It is simple. Click here to download the Hush City app on iTunes store! Click here to download the Hush City app on Google Play store! Click here to download Hush City app’s User Guidelines! Click here to download the Press Release & here if you are curious to learn more about the Hush City’s theoretical framework and related projects under development. This year I attended the Invisible Places Conference. And, yes, it was great! Invisible Places. 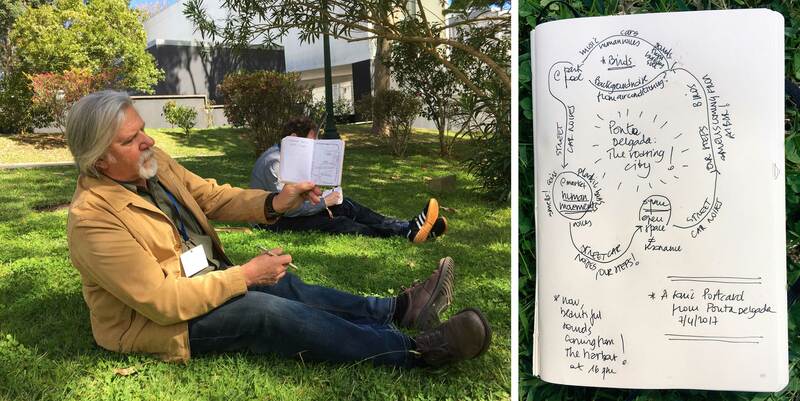 Sound, Urbanism and Sense of Place is a triennial* conference, which was kicked off in 2014 in Viseu, Portugal. The 2017 edition took place in the amazing venue of Ponta Delgada on April 7-9, at the University of the Azores in S. Miguel Island. It was organized by the brilliant Rachel Castro and Miguel Carvalhais, with the aim of bringing “together scholars, artists and theoreticians on soundscape art and ecology and encourage them to present new perspectives that will further interdisciplinary research and practice” on sound, urbanism, sense of place, and acoustic ecology. The program – very intense! – was composed of parallel talk sessions, workshops, concerts, sound installations and social events, in addition to three excellent key-notes by Juhani Pallasmaa, Hildegard Westerkamp and Sam Auinger. Due to the conference organization based on parallel sessions, there was no chance to attend all the presentations and events, so I had to choose and pick up what it would have been closer to my interests and background. During the first day, I attended the paper session no. 1, where Jordan Lacey and Stephan Moore presented the Transurban project made in Melbourne, Antti Ikonen discussed acoustic ecology in the digital era and Nicola di Croce dealt with the issue of sonic identity, illustrating the results of his sound art residency at San Cipriano Picentino (IT). 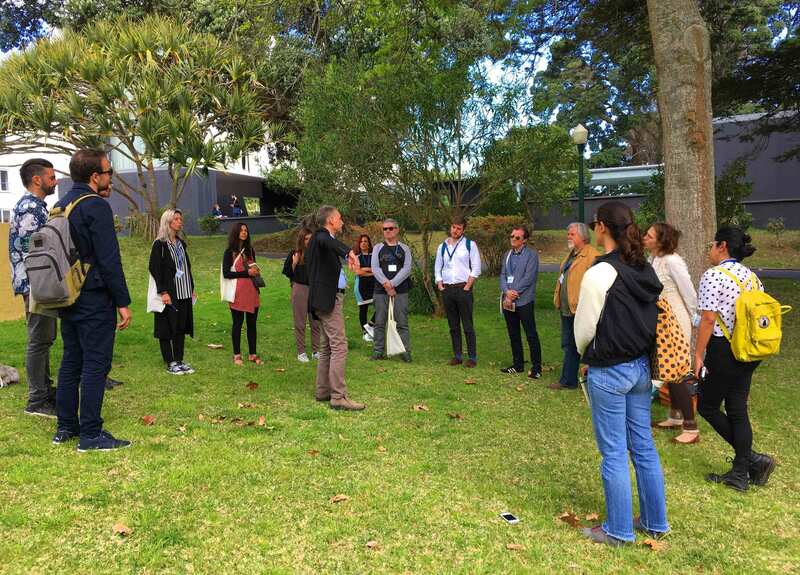 I also participated in the workshop run by Eric Leonardson and Amanda Gutierrez on how soundwalks engage urban communities in soundscape awareness. The workshop started with an introduction given by Eric and Amanda, who presented their approach to soundwalking and several soundwalk projects they have been involved in. Then we go out for the soundwalk: first, we made some exercises for ear cleaning and ear calibration then we soundwalked in the surroundings of the conference’s venue, exploring the beautiful and quiet park with the pool, the tiny and noisy streets, the lively market and the sonic effects given by the local architecture. Eric Leonardson giving indications on how to calibrate and clean our ears. At the end of the soundwalk, we were encouraged to draw our sound mental maps of the soundwalk and to discuss our impressions with the group. This is my Sonic Postcard from Ponta Delgada along with the map designed by Reinhard Reitzenstein! On the left, Reinhard Reitzenstein showing his sound mental map; on the right, my Sonic Postcard from Ponta Delgada. It was a very rewarding and inspiring experience! Day first ended with the key-note by Juhani Pallasmaa, titled Touching the world: through an historical excursus aimed to explain our vision-centred culture, he denounced that our “cities have lost their echo”, reclaiming for sensory architecture and urbanism in balance with our primary and most important sense: the existential one. The day after, I attended the talk session no. 9, where scholars and artists like Thomas Kusitzky, Eric Somers and Barry Morse presented their research works: Kusitzky, in detail, gave a talk focusing on “cultivating urban sound as object of design”, attempting to build a new theory for “auditive architecture”. In the afternoon, it was my turn! I presented the Hush City app, a new mobile app, which I have developed to empower local communities to identify, map and evaluate quietness on their neighbourhoods. Trough the Hush City app, I also attempt to create a bridge between the traditional acoustic planning approach and the soundscape one, allowing for the collection of both quantitative and qualitative data. Icon of the Hush City app. So, if you want to join the community and help us in creating a worldwide map of quietness, click here to download the app! Day two went on with the key-note given by Hildegard Westerkamp on “the practice of listening in unsettled times”. Hildegard Westerkamp is one of my heroes. And I was deeply touched by her talk, which was also very personal and moving. She encouraged us to practice a free and open listening, without barriers and prejudices, resisting to the impulse of providing advices and sharing experiences. She concluded her talk with a remarkable invitation to establishing connection with the acoustic engineers and hard scientists, in name of the inherent interdisciplinary nature of soundscape. After the key-note, a surprise concert by Peter Cusack took place in the beautiful frame of the Church of Mãe de Deus on the top of an hill, nearby the University, from where we could appreciate a fantastic panorama of the seaside. Delighted by the concert, we spent the evening together at the social dinner, where we kept on talking about soundscape research, sound art, architecture, future cities, smart mobility and so on. Time flew away! The final day of the conference started with the key-note Quiet is the New Loud given by Sam Auinger, who presented the project made by O+A in the frame of the 2015 Brugge Triennale. I was intrigued by the Earmarks map, which was one of the outputs of the project: a map reporting the most interesting sonic places of the historical center of Brugge. In some way, it recalls to my mind the Berlin Sonic Places, a research project done by Peter Cusack in 2012 in Berlin. It’s always interesting observing how sound artists approach architecture and urbanism and being inspired by their alternative ideas and visions. A collective sound expedition to Arquipélago concluded the conference: pictures and videos from these incredible days are available here on the Facebook page of the conference. I came back to Berlin full of energy and positive vibrations, and with many new ideas to test in the frame of my Beyond the Noise project. Thanks to the Invisible Places’ crew and to people from S. Miguel who made my stay an unforgettable experience! Views from S. Miguel. 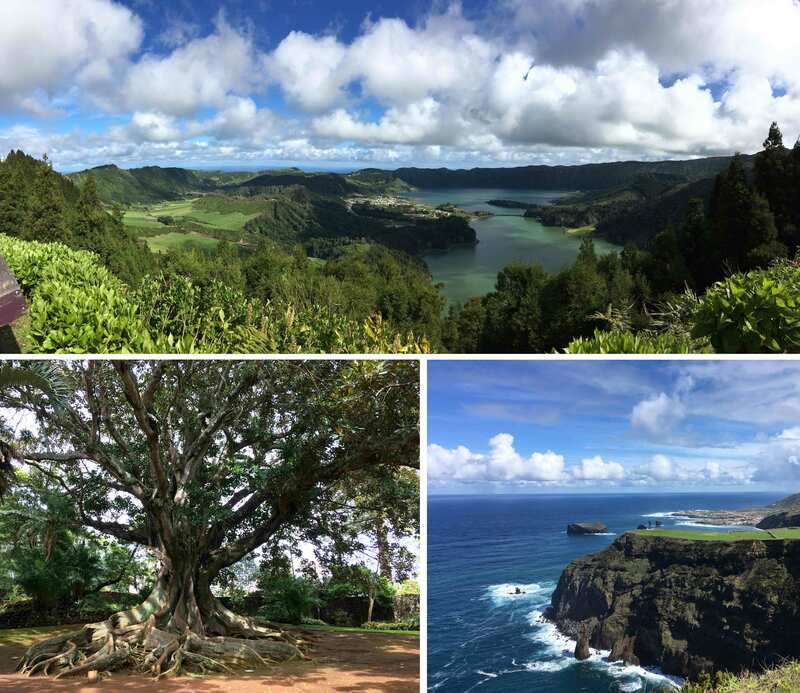 On the top, Sete Citades Lagoon; on the left, a sample of Figueira Australiana in the Botanical Garden of Ponta Delgada; on the right, the vulcanic coast of Ferreira. * Raquel and Miguel say that they “still don’t know if this is a triennial conference, let’s see where the wind will take us!“. Public presentation of the project in the Reuterkiez: March 9th, 2017 at 7pm! Stadtteilbüro Reuterkiez / Nachbarschaftsheim Neukölln e.V. 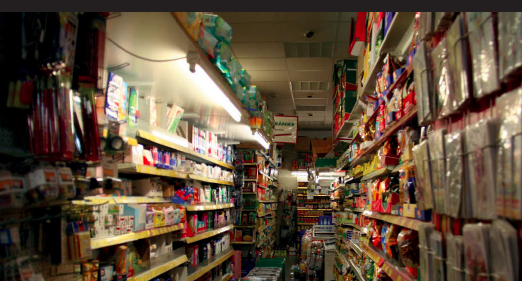 Beyond the Noise: Open Source Soundscapes. A mixed methodology to identify, assess and plan small, quiet areas on the local scale, applying the soundscape approach, the citizen science paradigm and open source technology. 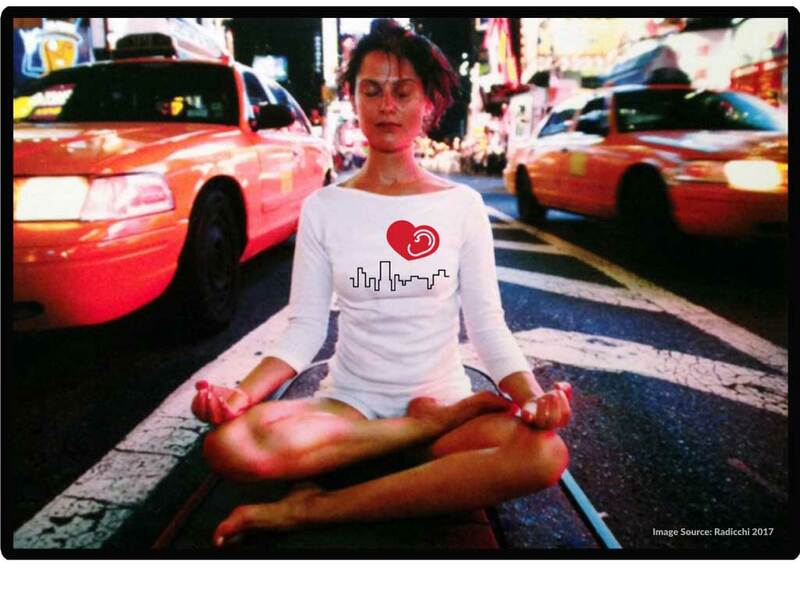 Today, cities have become increasingly noisier. In Europe, over 125 million people are affected by noise pollution from traffic every year, and apparently, quietness is becoming a luxury available only for the elites. There is a growing interest in protecting and planning quiet areas, which has been recognized as a valid tool to reduce noise pollution. However, developing a common methodology to define and plan quiet areas in cities is still challenging. The “Beyond the Noise: Open Source Soundscapes” project aims to fill this gap of knowledge by applying the soundscape approach, the citizen science paradigm and open source technology, with the ultimate goal of making quietness as a commons. Accordingly, a new mixed methodology to identify, assess and plan small, quiet areas on the local scale is tested through the development of a pilot study in the Reuterkiez, a Berlin neighborhood affected by environmental injustice and noise pollution. In this pilot study, a number of citizens are involved in crowdsourcing data related to “everyday quiet areas” by using a novel mobile technology: the HUSH CITY app. 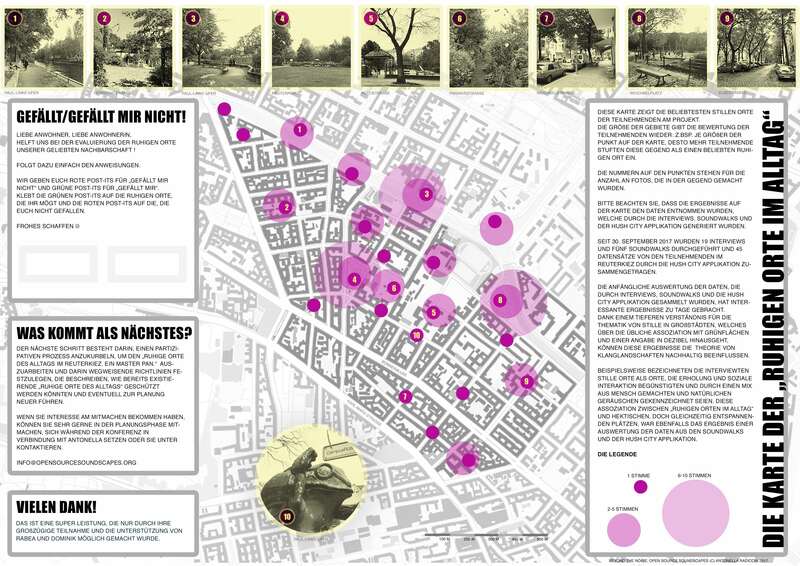 The contents generated in the project will be embedded in the: Open Source Berlin Atlas – a virtual, open, interactive and multi-layered map; and in the Design Tools Kit – a digital report on how to protect existing “everyday quiet areas” and planning new ones. 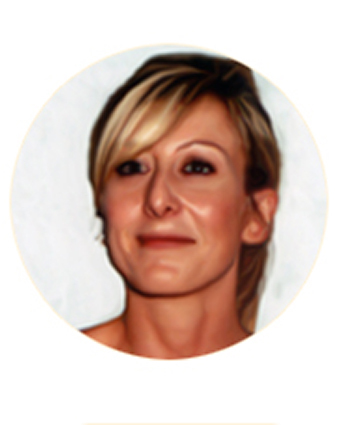 The project: “Beyond the Noise: Open Source Soundscapes” is currently under development by Dr. Antonella Radicchi at Technical University of Berlin. Project Supervisors: Professor Dr. Dietrich Henckel (Technical University of Berlin), M.A. Jörg Kaptain (Berlin Senate, Senate Department for the Environment, Transport and Climate Protection). Acoustic Consultants: Professor Michael Jäcker-Cüppers (Technical University of Berlin), Dipl. Ing. Manuel Frost (Berlin Senate, Senate Department for the Environment, Transport and Climate Protection), Dipl. Ing. Mattia Cobianchi (Bowers & Wilkins, UK). The pilot study is proudly conducted in collaboration with Rabea and Dominik from the Stadtteilbüro Reuterkiez! The project has received the no-profit istitutional support of the Berlin Senate and it will be developed in accordance with the Berlin Senate, Department for Urban Planning and the Environment. The research project has received funding from the the IPODI-Marie Curie Fellowship – People Programme (Marie Curie Actions) of the European Union’s Seventh Framework Programme (FP7/2007-2013) under REA grant agreement no. 600209 (TU Berlin/IPODI).